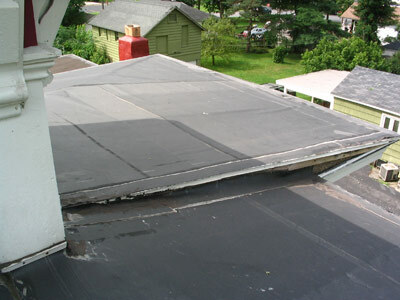 I’ve been hesitant to reveal our roof repair plans on the site for two reasons. The first is that we kept changing our minds, and I didn’t want to confuse everyone by flip-flopping. The second reason is that I fear our final choice isn’t going to be too popular with some of the purists out there. 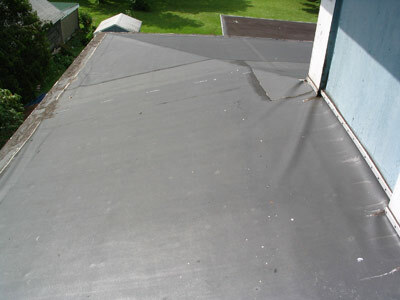 We’re replacing our main roof because it leaks in the winter, when snow and ice build up and sneak into the rubber seams, melting and making a mess. We’ve patched it 3 times since moving in two years ago, and still sprung a leak this winter. It is very hard to patch rolled rubber; nothing sticks or seals well enough! 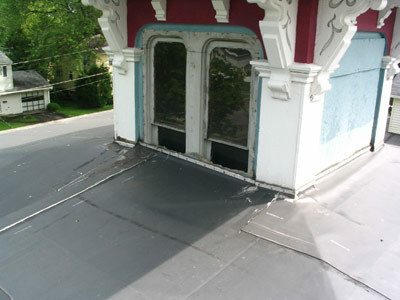 The leak is always in the same area, right around the cupola which was not flashed in correctly as you can see in the photo below. In our heart of hearts we wanted to do the “right” job, the restoration job, by tearing off all of this newer roof plus the remains of the lower roof, replacing any dimensional lumber decking that was damaged, and essentially redoing the entire thing from scratch. But this route is infinitely more expensive and time intensive than the alternate route. We’d also have to rent a torchdown and some other odd tools to accomplish the feat. After MUCH research, polling, debate, and emotional turmoil, we’ve decided to leave the roofline as-is. In terms of return-on-investment, the time and money needed to fix this visual issue just wasn’t worth it to us. We didn’t even notice we had a raised roofline until we climbed up onto the roof, so why would other people? From the ground, the roof is so far up that you never get a clear view of it. We’d rather invest the additional funds in something we’ll get more enjoyment out of, like a fence for the dogs or walls in our hallway. Our plan is to take off this top layer of rubber and insulation, patch any of the plywood decking that needs fixing, and lay new insulation, felt paper and asphalt over the top. Teague, who worked for a local roofing company years ago, is raring to go. I’m less excited about being that high off the ground, but I’ll get over it. We will have the help of his fancy new roofing nailer, so that part should go quickly. Instead of leaving the cupola all awkward like it is now, we’re planning to leave the top-half of the windows showing and hide the bottom sash behind some nice wood trim. We also have some repair work to do on it- 7 out of 16 panes are broken (hence the boarding-up with plywood) and it has some rotting trim that needs replacing. Our roofing adventures begin this weekend – wish us luck! Don’t feel too bad about the roof. Sometimes the purist route just won’t work. The Devil Queen originally had wood shingles. If we’d gone the purist route and installed new ones, not only would the installation costs have been astronomical, but our insurance costs (fire hazard) would have too. Sure, it would have looked great, but we just couldn’t afford it. Be safe and good luck with the roof. If the pitch of the roof is too shallow, you probably still need a torch-on roof. Shingles look like they’d leak on that low of a pitch. Flashing looks like an issue around the cupola, it needs to go up a lot higher, since you guys get so much snow there. I’d think you’d want it to be waterproof 1′ up the cupola. Do some research on Italianate cupolas and you will find many great ideas for dealing with the shortened windows. Dover Publications has a great one with lots of Italianates – Bickenells Victorian Homes ( or houses I think). Just do what is best for you financially and what you can live with. That is a tough call. A complete tare off would be best, but I totally understand the reasons for not doing it. My last house (1875) had a 1 story addition against a 2 story house. It ALWAYS leaked where the two met. It was very frustrating. The reason it leaked was not the design or the shingles it was the non existent flashing. I patched every year with roof cement, and every year I said I was going to put in correct flashing, but I never did. PS Love the cupola. Those corbels are fantastic! Thanks for the support and tips, guys! We’re definitely going to add flashing around the cupola, and a wider drip-edge to the outer sides. The shingles and underlayment we’re using will be up to code for the pitch, and we’ve seen many houses around with similar if not flatter roofs using shingles, so we stuck with asphalt.